So Helen has asked (read “told”) me to write her latest blog entry in order to try and give a different perspective to the last 6 months- pretty much to the day in fact. Therefore this post may not reflect Helen’s views and she accepts no responsibility for what will no doubt be a poorly thought out rant. Those of you that know me, know that I have a habit of “wearing my heart on my sleeve.”, if this post offends you, I apologise but I’m going to say it as I see it. I’ll manage some expectations here and now- rather fittingly I have no idea what or how to write about what has really been a dark half year. Sorry- I can assure you normal “perky” service will be resumed next week. I think the first thing that springs to mind is the disbelief that it has actually been 6 months since we first began trying to cope with a very vague, bleak and unpleasant immediate future. I think it’s fair to say I didn’t deal with the initial diagnosis well. Having made acquaintances with cancer in the past, my immediate reaction was to expect the worst case scenario and try and plan with that in mind- impossible to do and ultimately futile. People will say this is a typically pessimistic, "glass half full" Nathan approach. As normal I’m more than happy to disagree! I like to be prepared so anything that appears as a silver lining beyond the shadows of my dark little cloud is a bonus. Let’s be clear there have been a lot of bonuses as a result so I get to sit back with a wry smile on my face. To see Helen now (hopefully) at the end of her Chemo and just beginning her Radiotherapy is truly fantastic. I know at the beginning there was a lot of hippy ( :-) ) chat about eating lentils mung beans and other "anti-cancer” food. I’d really like to credit a change in lifestyle with Hel’s continued progress yet Helen’s continued flirtation with KFC, curry and wine throughout her treatment would suggest otherwise; her Oncologist confirmed as much when he underlined the need for a positive, can-do state of mind. It’s clear Hels has always had this in spades. I think at this point its massively appropriate to attribute some of her eternal optimism to all the well wishers and support we have had, everything from the highly vocal support from close friends to the subtle, less tangible "hand on shoulder" that I may have had here or there. Now this isn’t to say that we don’t appreciate all the help we’ve had and God knows we’ve had A LOT (and will continue to do so unless this Blog annoys everyone and you all leave in droves) but some stuff just has not been helpful, well at least not that I can see. 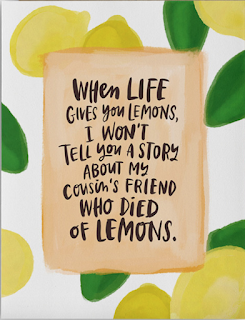 If recommendations about TV shows etc, with a high lemon content and an unpleasant, bleak and “zesty” conclusion could be avoided I would greatly appreciate it. 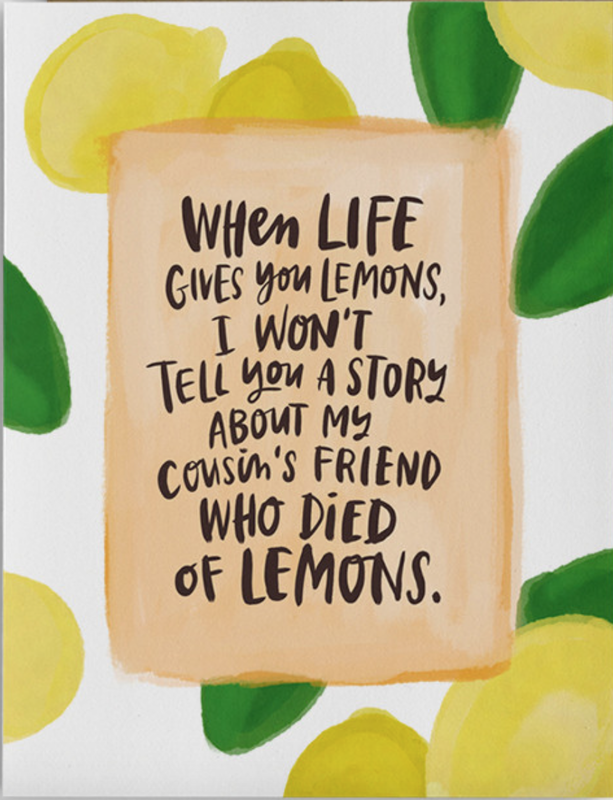 Yes it may be cathartic, it may even help Hels and others currently munching their way through a whole lemon grove come to terms with their illness and mortality but for family members dealing with the fallout, it really does us no favours at all. Normally I’m the one who has to apologise for my galling lack of tact and diplomacy but there have been times when the sheer ignorance of people’s comments has made me absolutely seethe. I don’t mind admitting that if I ever meet some of the offending characters that have previously featured in Helen’s blog I will joyfully serve up a healthy dose of scathing wit and sharp tongued justice that will make your eyes water more so than any lemons might. Also for any opportunists who see other peoples’ misfortune as a chance to feather their own nests; life has a way of paying you back in spades. Cancer makes you fiercely protective. Who knew? I really hope I haven’t offended anyone (that we care about). This post isn’t really what I intended, perhaps a nice lesson for my year 10s about the importance of planning your work before writing but that’s for another blog entirely.